Magic yourselves back to those crazy, heady, optimistic days of the sixties! With rationing and conscription over, Rock 'n' Roll gave youth culture a voice... London became the most fashionable place on the planet... Hippies encouraged free love... and man landed on the moon! Here's a chance to relive a little of those swinging days! Audio CD including eight Number One hits of the sixties! CD Challenges to test your guests... from Quiz Games to Guessing Games, Guess the Year to Memory Games! Host's Guide to help recreate the sights, sounds & sensations! Invitations to fill your house with Mods and Rockers! Period Recipes for you to try... easy to prepare in advance! 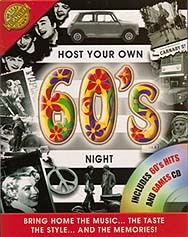 Action Games to celebrate the sixties..., Dancing games, Race games and Beatle Drive, the Fab 4 dice game..! AND 'Pin the Flower on the Hippy'!